Colombian rider José Serpa today took his second Tour de Langkawi title, winning the 2.HC race for the second time since his 2009 triumph. The Androni Giocattoli – Venezuela rider finished safely in the main bunch, protecting his overnight lead, while the Italian sprinter Andrea Guardini powered to his sixth stage win of the race and an incredible eleven in two years. Having earned yellow with back to back stage triumps, Serpa ended the ten day race thirty seconds clear of his Androni Giocattoli – Venezuela team-mate Jose Rujano, who won the race in 2010. Niño Victor Corredor (Azad University Iran) was one minute and three seconds back in third, while fourth-placed Alexandr Dyachenko was best Asian rider and helped his squad to best Asian team. The victory is the latest in a long run of successes for the Androni Giocattoli – Venezuela team at the race. Gianni Savio’s team has taken the overall title six times in all, winning with Hernán Darío Muñoz and Freddy Gonzalez in 2002 and 2004, with Ruslan Ivanov in 2008, with Serpa in 2009 and again this year, and with Jonnatha Monsalve in 2010. The squad will now build up for the Giro d’Italia, where it hopes to fight for the overall title. Unsurprisingly, Guardini’s six stage wins earned him the blue points jersey. He had been equal on points with Valentin Iglinskiy heading into the stage, but his victory ensured that he moved well clear. He said that his team was a big part of that success. “It has been a very difficult day. We understood from the first kilometre that we would be the only team to have the responsibility for the race,” he said. “We kept the breakaway in sight. My four helpers have done such a great job that I want to name all of them; Balloni, Rabottini, Bertolini and Benenati. Prior to that, they hauled back a long distance break comprising Misbah M. Rauf Nur (Malaysia), Joon Yong Seo (Seoul), Shinichi Fukushima (Terengganu Cycling Team) and Sea Keong Loh (OCBC Singapore). They also controlled a subsequent break involving Alexandre Vinokourov. 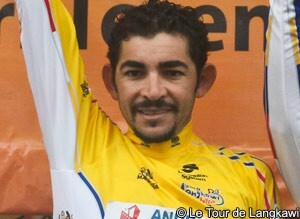 Serpa took the mountains classification and his Androni Giocattoli – Venezuela squad was best team. Serpa was under no rush, being able to roll across the line and savour is own triumph.